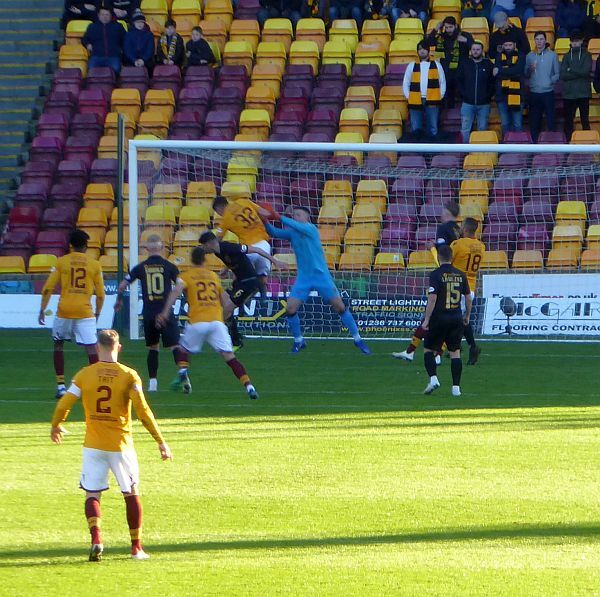 An outstanding opening blitz saw Motherwell race into a 3-0 lead over Livingston at Fir Park. The goals from Curtis Main and a double from Jake Hastie were enough to deliver a fourth consecutive win with the help of a third clean sheet. We blew the opposition away with a blistering series of attacks that had the game safe after 20 minutes. The visitors were overwhelmed and had no answer to the free flowing claret and amber swarm that laid siege to the South stand goal. The manager fielded the same eleven that had delivered the last two wins and with confidence high in the bright winter sunshine they soon showed their attacking intent. Livingston conceded a couple of early free kicks on their right back area and from the second David Turnbull delivered a cross to the near post. Hastie rose high to head beyond Kelly to set the scene after only six minutes. We continued to press and Gboly Ariyibi showed his skill before trying his luck. It took six minutes for us to double the lead when Curtis Main collected from Allan Campbell. From around ten yards he lifted the ball over the ‘keeper and celebrated in front of the ‘Well Bois. Livingston made few incursions to our box but we had Mark Gillespie to thank when he threw an arm high to deflect a chance from Ryan Hardie. The corner that followed set us up for the third goal. With the majority of the players in and around our box and the ball in Gillespie’s hands the ‘keeper spotted Hastie lurking at on the halfway line. The ‘keeper threw long and Hastie gathered. He charged into the opposition half and passed a couple of defenders before firing beyond Kelly. Game, set and match. There were further opportunities but the break arrived to give the visitors some respite. Gary Holt sent three substitutes on for the re-start. There were no more goals although both teams had a couple of chances in the second period. It was an excellent showing from Motherwell that now has us matching Livingston’s 30 points. The target now is to extend our run to five in a row when we travel to paisley on Wednesday.